The Learning Factory shop safety regulations are posted online and must be read by all students. Before a student is permitted to use Learning Factory shop resources, s/he must pass the Learning Factory Safety Quiz and complete the safety and power tool training. Please note that the quiz must be successfully completed prior to signing up for the in-person safety training. OSHA approved safety glasses or goggles must be worn in all areas of Learning Factory. Safety glasses must have wrap-around side shields. Students must provide their own glasses. 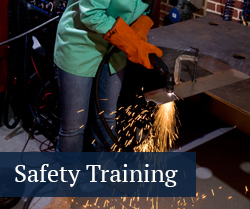 Only students who have completed the Safety/Power Tool training class are permitted to be in the shop. Long pants, short sleeve shirts, and socks are required while in the shop area. Shorts, dresses, dangling or loose clothing will not be tolerated for safety reasons. Neckties must be removed. Shoes must have closed toes, and cover the entire foot. Protective spats should be worn in the welding areas. Over-the-ankle work shoes with steel toes are strongly recommended. Long hair must be tied back so that it will not fall into a machine or your work area. All jewelry (rings, necklaces, bracelets, watches, etc.) must be removed. Instruction manuals for all machines are available upon request. If you have any doubts or questions, ask for assistance before operating machines. Please respect others in the lab. If a class is in session, do not use any loud machinery. Do not attempt to repair or alter machines at any time. If there is a problem, notify shop personnel immediately and do not operate the machine. Anyone working in an unsafe manner will be asked to leave immediately and their working privileges will be revoked. It is strictly prohibited to be in the Learning Factory while under the influence of alcohol or drugs. Anyone found in the facility under the influence will have his/her privileges permanently revoked. Please respect and preserve the facility. Clean up your own mess and return tools to their proper place. 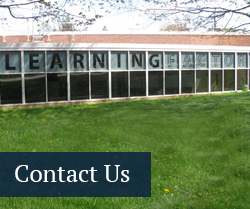 Many resources within the Learning Factory are equipped with a dedicated set of precision tools. Students are responsible for using these tools properly, cleaning them when done with their use, and returning them to the appropriate storage cabinet. If tools are damaged during a session, students are to immediately report this to a Learning Factory representative. Standard cutting tools (e.g., drill bits) are provided. Users are required to sharpen all tools after use. Machines are provided for sharpening of drill bits. In the case of excessive breakage caused by improper usage (two or more broken items), users will be asked to replace the broken items. To maintain a clean, safe working environment, it is a student's responsibility to clean up their work area after completion of their session. Brooms, dustpans, and shop vacs are provided. Students are expected to provide their own construction materials and supplies. A limited supply of materials is available for student use in the Learning Factory. These materials are donated by industrial sponsors or purchased by the Learning Factory and may vary in availability, quantity, and quality. A restocking fee will be charged for the use of these materials. There is no fee for using the machine tools (mill, lathe, saw, grinder, CNC mill). The Rapid Prototyping machines and the water jet will be charged the replacement cost for all materials used and are detailed below. This equipment is only for projects related to university courses, research, or groups. No personal projects are allowed. Full material replacement costs will be charged for research projects (graduate and undergraduate), clubs, faculty, and course development. Learning Factory-supported undergraduate engineering course projects will be charged at 50% of the replacement cost listed below.